Let's say TJ Maxx is not one of bob's frequent shopper destinations, but recently bob was caught snooping around not one but two different area stores multiple times. Gourmet Italian and European food products in the Home department was the magnet. There must be a story behind this product line at that store but where would you go to try to uncover it? Roi crema di rucola (alias arugola in the US, a.k.a. "rocket" in the UK) was a multiple purchase item. The TJ Maxx label says: "Compare at $7.00, our price $3.99". Americans love the 1 cent less trick, used in gasoline prices as the one tenth of a cent less per gallon price that seems to be a matter of national law: "The Final Nine Pricing Rule". How else could ever gas price in the country that we've ever seen end in 0.9 cents per gallon? This "arugola cream" is produced in Baldalucco (IM) Italy. Sounds like a pretty authentic Italian town. Ingredients listed as "rocket, extra virgin olive oil, salt, no coloring or preservatives." I guess that puts it approximately in the pesto family. And "a specialty of an antique Ligurian tradition." Hmm... so it must be near Genova (=Genoa, the pesto capital) somewhere, but IM? One of the more obscure Italian provinces? The company "where we are" page says they are near Genova and nearer to the music festival town San Remo. Let's leave it at that. One of those little mysteries of life. No more arugola cream left on the Main Line. bob tried one and liked it, then bought a few more. Every one he could find. There weren't that many. Good with cheap Trader Joe's tagliatelli imported from Italy, or on practically any kind of pasta. We usually do a half jar in a pound of pasta, or a third of a jar in a half pound of pasta if we don't want to overdo it. One jar being approximately 7 oz or 200g, though neither unit appears on the jar. Following the Italian pasta sauce motto "less is more". Adding a bit of zing by sauteing briefly a pressed garlic clove in a few tablespoons of olive oil first, the immediately dumping in the pesto to stop it from going too far. A little pasta water with the pasta and generous freshly grated parmigiano and bam! It's ready. Not enough to claim as a recipe. So one spring evening asparagus is $.99 a pound at the local supermarket after work on a weekday (the 1 cent less rule again), half the usual bargain price, so bob decides to do a quick pasta with it. The Trader Joe jar of asparagus appetizer in the supply stash would probably be too much asparagus if the fresh asparagus was going into the mix which it was, so the last third of the opened jar of arugola pesto in the fridge was called into action. Let's see, how many pounds in the bunch? Fishing out the receipt and scanning down to the asparagus, it reads 0.99 lb @ .99 /lb = .98. So that's where the internet @ symbol came from. Somebody must have been reading their supermarket receipts. We used about 2/3 of the cooked asparagus in the pasta. About 66 cents worth. Or was it about 3/4 lb? This eyeball estimation stuff is not very reliable. The whole pound would have been good too. We reserved a few for the next dinner. Start the pasta water boiling. When ready, salt and dump in the pasta. We always eyeball the salt quantity too, and have no idea what amount is correct. We've probably been wrecking our pasta for years, but ignorance is bliss. Cook until al dente. Meanwhile clean the asparagus and remove the hard ends. We did it in one cut with our large chef's knife. Cook until tender in an upright asparagus pot. Put the oil and garlic in your 4 quart chef's pan and saute briefly, then dump in the pesto and stir around a bit. Turn off the heat. Cut the drained asparagus into 1/2 inch pieces and toss into the pesto. Grate the parmigiano. Also eyeballed. We like lots so maybe we used more. So when you drain the pasta, don't worry about excess pasta water and dump it into the chef's pan. Stir around a bit. Hit with the pasta water and spices. Mix it up. Ani's sister Nora is a shopping bargain ferret, always finding incredible clothes at TJ Maxx for a couple of bucks or even less. Many of which she donates to Ani. Ani did not get the bargain shopping gene. Bob once found a yogurt sieve at TJ Maxx. For making labneh, a.k.a. yogurt cheese. It sat in the closet until bob gave it to Ani's mom, hoping someone would use it. She also makes great plain yogurt. But now it is just sitting in her closet. TJ Maxx is a national chain of economically priced clothing and some home products. It may not be your first choice for shopping, but once you nose around, you can find some great buys. Italy is divided into 20 regions (if I counted right) which are like states in the US, and each region is divided into provinces, like counties in the US, although any further comparison probably makes no sense. dr bob's adopted home is the province of Rome in the region of Lazio in central Italy where the line between North and South is drawn either above or below "the city where nobody works" (as the seat of the government and its bureacracies) depending on who is drawing it. The two letter province abbreviations used to be on the license plates in Italy, but this practice was finally ended, partially due to regional tendencies to treat people differently based on their origin. Not a nice thing. Every country has its own problems, right? Well, Nora told a culinarily inclined neighbor about the TJ Maxx arugula pesto (turns out that "arugola" is a rarely used spelling) and she said she had tried an arugula pesto from epicurious and loved it. We had tried to invent arugula pesto a few years ago by simply replacing the basil by arugula in normal pesto, but it was too strong (=bitter) for our taste. 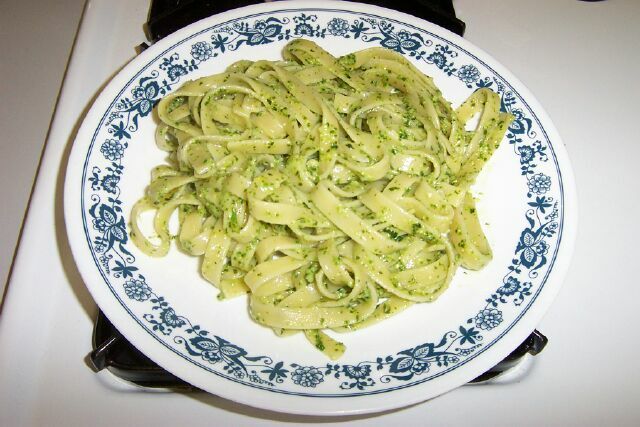 Among the various arugula pesto recipes we found at epicurious was a mix of 2 cups packed arugula to 1 cup packed basil leaves, with some lemon peel [Bon Appetit, June 2001, Flavors of the World]. We backed off and went 50-50 with the greens and the cheese and remembered our experience with the Bini family pesto in Sabaudia: add in the cheese at the pasta mixing stage, not before. Start the pasta water boiling and when ready throw in the salt and a long pasta like tagliatelli or fettuccine, although this would also work with our pesto favorite target: fusilli. Cook al dente. Food process the food processor stuff. When the pasta is ready, drain and combine first with the pesto sauce, then incorporate the cheese and if necessary a tablespoon or so of pasta water. This fresh pesto business is so easy. A little more work than opening a jar, but at least you know for sure what's in the mix. This time we snapped a photo. We made this for a family dinner not long afterward but made the mistake of diluting the sauce per pasta ratio: we had 2 lbs of fresh fettuccine so we could make up 1/2 lb separately for the fussy kids who could only tolerate some butter and cheese on their pasta. We threw the other half pound into the adult pasta pot. And then another quarter pound when it remained after the kids were served, so we had the same amount of sauce but 1.75 times as much pasta, and the same kick was not there. Respect the ratio.